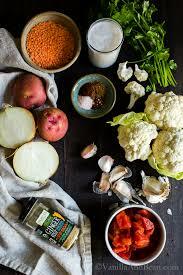 Cauliflower Curry with Sweet potato. HI to all my fellow home chefs here on the east coast of Africa, and around this beautiful world we live in. 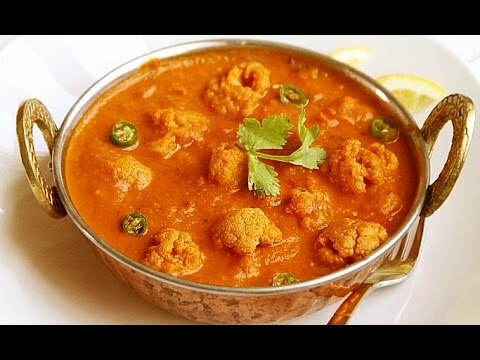 Cauliflower curry is on the menu today, believe me once you have tried this recipe you will most definitely file it under FAVOURITE curry dishes. 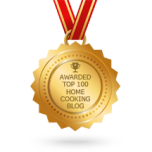 Not only does it stand out as a simple recipe, but its really tasty and easy on the purse strings. Okey Dokey the time has come to gather our ingredients for Cauliflower Curry. You can use either Sweet Potato or plain potato.. I must say that I always find it easier to get all the ingredients together so when you start the prep work, you don't have to start running around looking for this and that. Right today we will use Sweet Potato's with our Cauliflower. 2 med Sweet potato, peeled and cut into bite sizes. Cook the onion for 10 minutes until soft, then add the ginger, garlic, turmeric, cumin and curry powder. Simmer for about a 1 minute stirring. Add the tomatoes and sugar stirring until all the mixture is combined. Add the cauliflower, potatoes and split chilli, seasoning to taste. Add a drop of water if you need to, but not to much as it is meant to be a dry curry. When vegetables are soft and tender, remove the chilli..
Add a squeeze of Lemon and scatter with fresh Dhania(coriander). 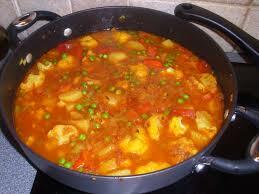 Great congratulations you have just completed a tasty vegetable curry. Time to relax ,and put your feet up and enjoy a glass of beverage of your choice. . Serve with your choice of Indian bread. Add a dollop of yogurt. I leave the choice up to you.